Denso Corp. supplies the new Saab 9-5's high-end, voice-operated infotainment/navigation unit. The system has numerous features including a hard-drive for storing audio tracks and a time-shift function to stop and replay live radio programs. The audio output is played through a Harman Kardon surround sound system. 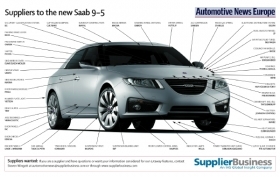 Saab launched the second-generation Saab 9-5 in 2010, 13 years after the first model debuted. The sedan shares its platform with the Opel/Vauxhall Insignia. Opel/Vauxhall and Saab were sister brands under General Motors Co., which sold Saab to Spyker Cars NV in late February 2010. ContiTech AG's Vibration Control division. The business unit supplies the 9-5's plastic power unit mounts, which are used on the engine, transmission and other parts. The mounts damp vibration and prevent the powertrain from coming into direct contact with the automobile's body. The fasteners need to be very secure to prevent powertrain detachment, which is a possibility during a collision. Such high-strength requirements normally require the power unit mounts to be made from steel or aluminum. However, ContiTech's fiberglass-reinforced polyamide units meet those strength requirements while also reducing weight, which leads to better fuel economy and a reduction in CO2 output. In addition, less heat energy is required to mold plastic than aluminum, further underling the product's environmental credentials. The mounts are made at ContiTech's factory in Hanover, Germany. Haldex AB supplies the automobile's all-wheel-drive system to which American Axle & Manufacturing Inc. provides the rear-drive module. AAM produces the rear-drive module at its plant in Silao, Mexico.